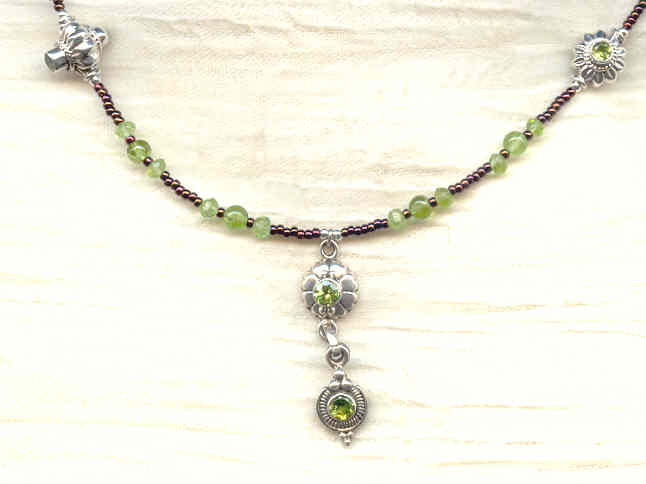 Take faceted peridot gemstones, set them in sterling silver, and make them into a gorgeous pendant necklace, and add one terrific price. Is that a winner, or what?! Bright, sparkling green peridot is not only the birthstone for August, it's also the perfect color to wear with summer fashions. Peridot is also the traditional stone associated with the 16th wedding anniversary; and is sometimes associated with the astrological sign Libra. 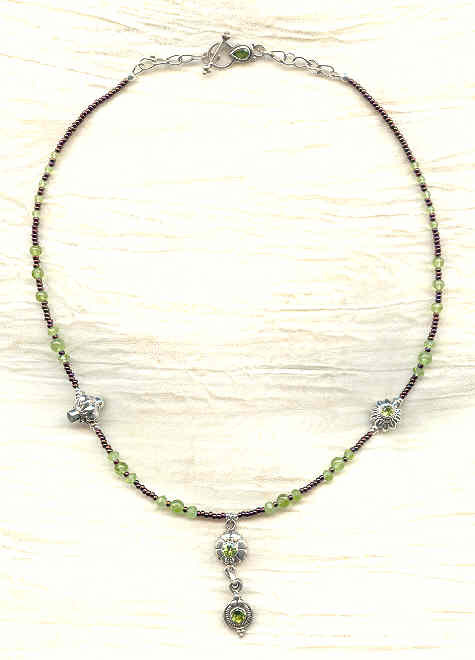 In this dainty pendant necklace, the gemstones in the pendant are faceted and set in sterling silver, as are those on either side of the sterling silver flower beads in the strand. I've used a metallic rusty merlot colour as the basis of the strand, punctuated the pendant necklace with smooth round and faceted roundel peridot beads. The 18-1/2" strand closes with a sterling silver toggle clasp set with a faceted teardrop-shaped peridot. It's another elegant pendant necklace from SPARKLE PLENTY. The lapis lazuli in the pendant and matching oval beads comes from mines in Afghanistan, and is thus the finest of its kind.